The Make Reports page is separated into 3 sections along the top. Daily Records show all of the entries made on a per day basis. We use a version of the standard operations report to show all of your entries as well as print out Detailed Breakouts of each of your entries and any comments / explanations associated with those entries. To create a daily record, select a date or date range from the date select windows and click Go. If you are printing multiple records over a date range, several links will appear in the window that breaks the range down into smaller ranges. Simply click the links to produce the reports. If a report is available to print on either the Report of Operations or Excise Tax Returns tabs, a printer icon button will be available. To see past reports, click the orange icon. To create a PDF report, click on the printer button. Depending on your browser configuration, you will be prompted to save a PDF to your computer or the PDF will open in a new window. From there, you can print it out and mail it in or use it to fill out your pay.gov electronic form. Please be sure to double check your reports before submitting them! The navigation for the Make Reports page is located on the left. If navigation is not showing, click on the ‘expand/collapse’ icon to the left of the TTB Tamer logo. The first section of the navigation bar is for your Report Settings. These are carried over from your Account Settings, however, you can adjust them here if needed. You can also choose to see historic reports (reports with due dates that have already passed). 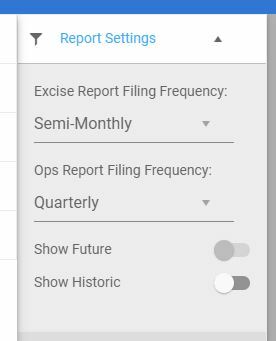 Links to tax returns and ops reports for the current period, and past returns if you’ve selected ‘Show Historic’ in report settings, will appear under the Excise and Operations headings. 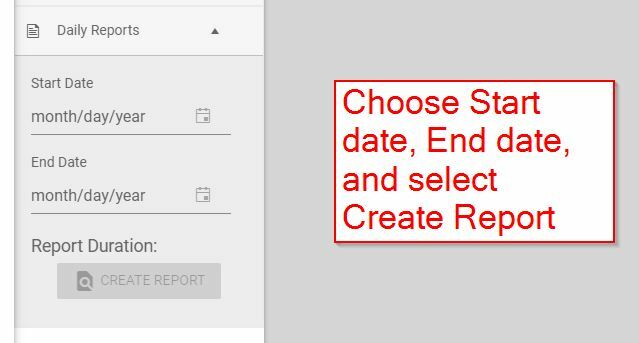 Simply select the period you want to create a report for and the pdf will be generated in the window on the right. Note: the navigation bars will automatically collapse when you generate a report. Click on the ‘expand/collapse’ icon to the left of the TTB Tamer logo to expand the navigation if it’s collapsed. The page header will show when the report is due, navigation arrows to move between pages of the report, and a download button to generate and save a PDF to your computer. 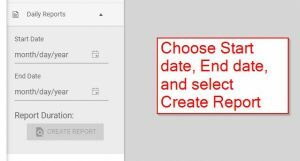 To create daily records over a period, choose the dates you would like to generate records for and click Create Report. Records for each day will be generated in the window on the right. Navigate between each day using the page navigation found in the header of the page, or download the collection of reports as a single PDF.